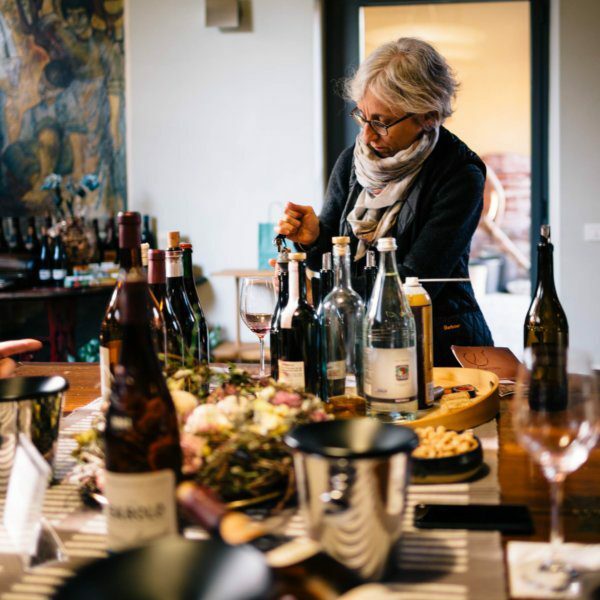 Barolo and Barbaresco are often referred to as the King and Queen of Italian wines, so on our trip through Piedmont with our friend and wine expert Ceri Smith, visiting these two villages was our highest priority. The hilltop town of Barbaresco is so beautiful and quaint – it’s an absolute must if you’re visiting Piedmont. High on the hill, Barbaresco is filled with pastel colors and views between the buildings of vineyards and a river down below. We stopped into the Produttori del Barbaresco, which is a wine collective, for a tasting. 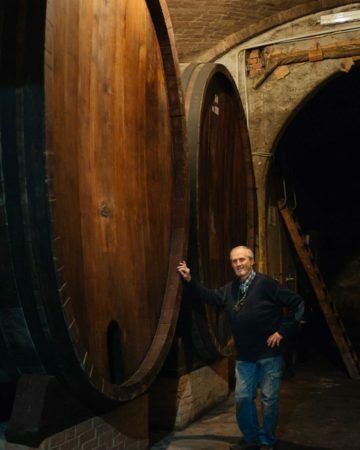 The Produttori has 54 members (individual grape farmers), and the winery combines the fruit grown by each member (which may not be enough to bottle separately) and each year produces a Barbaresco D.O.C.G. wine and a Nebbiolo Langhe wine. In exceptional years, the winery may produce single-vineyard Barbaresco from certain classic villages. If you’re not familiar, Barolo and Barbaresco are both made from the Nebbiolo grape, which has been grown in Italy’s Piedmont region since the 13th century. The grape is very sensitive to different soil types, which explains why the wines produced in these two regions from the same grape can taste so markedly different. Barbaresco starts off very tannic (although more elegant than Barolo), so it needs 4-8 years of bottle age before it really starts to shine. The Nebbiolo Langhe bottling is much more approachable and more suited for everyday occasions. We actually found it on a wine list in the Bay Area at a group dinner and ordered a bottle — our friends are still talking about how good it was. If you’re planning a trip to Piedmont, a stop at the Produttori is a must. You don’t even need a reservation. If you’re lucky, they may have a single vineyard bottling open, in addition to the last two vintages of Barbaresco D.O.C.G. They also may have grappa available to taste. 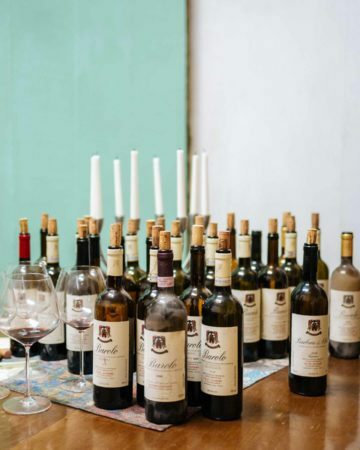 Be sure to leave room in your suitcase for a few bottles, or plan to check a case, because their Barbaresco wines are incredibly affordable.